Komoot: A platform for sharing experiences and journeys. | Foto (detail) : © Komoot. Sharing is on the rise. One in five Germans already uses a sharing app, and Germany is also a hotspot for app development. “Verily, whoever possesses little is that much the less possessed: praised be moderate poverty!”, philosopher Friedrich Wilhelm Nietzsche once wrote. He clearly felt that status symbols had a power beyond their monetary price, and exacted a psychological toll on owners as well. Indeed this “obsession” with owning expensive things to signify social standing is visibly decreasing in our society. More and more people prefer sharing to owning. The sharing economy is growing, and expanding into an increasingly number of areas of daily life. According to a PwC study one in three Germans is actively participating in sharing platforms in 2018, and the trend is on the rise. More than two thirds of these sharing economy users share rides, tools or bicycles. Car sharing, used clothing exchanges and renting out unused private living space are also in vogue. Here Germany places well above the European average, according to data from the EU and the consumer advice centre. Demographically, sharing economy users tend to be young and well-educated. They don’t value status symbols as much, and feel owning less improves their quality of life. Sharing also makes sense from an economic point of view. A lot of household objects, like tools, spend most of their lives just taking up space on a shelf until they are needed. Sharing means fewer objects get more use – which saves money and conserves resources. There are also social advantages, as people have access to things they would not otherwise be able to afford, and interacting in the sharing community strengthens local networks. Germans are not just using the sharing economy; they are also playing an active role in shaping it. “Made in Germany” apps are available for almost every aspect of modern life. The sharing trend is particularly visible in the mobility sector. Around twelve million Germans are involved in either car or ride sharing. There is a huge selection of apps and options on the market, especially in urban centres. 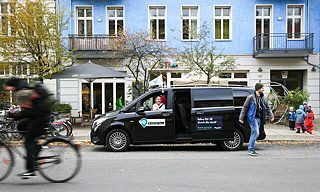 CleverShuttle e-cars, for example, are now making the streets of Berlin, Munich, Leipzig, Hamburg, Frankfurt, Stuttgart and Dresden more eco-friendly. Allygator is an inexpensive option in Berlin, where its shuttle buses ply the streets of the capital for just five cents a kilometre. Berlin-based car-sharing app, Allygator, coordinates shuttle-bus rides. | Photo: © Allygator BMW’s DriveNow has paved the way with some 6,000 vehicles available throughout Europe. Berlin-based Free2Move is helping consumers navigate the dizzying array of options. Its app offers a map of all car-sharing providers and helps users price shop. There is also no shortage of supra-regional options either. Mitfahrgelegenheit.de, which started as a student project in Munich, was one of the first platforms that allowed drivers to sell space in their private vehicles to travellers heading the same way. For 15 years, this was how Germans to split the cost of petrol for long-distance trips. Users balked when the new fee model was introduced though, and the company went under in 2016. French BlaBlaCar has since taken over as a carpool provider. Bike-sharing is at least as popular as ride sharing. The Deutsche Bahn’s Call a Bike rental service has been around for almost 15 years. Their rental bikes are now available in over 50 cities, and more and more companies are jumping on board. Is ownership going out of style? The German sharing economy now extends far beyond car and ride sharing. Left-over food is finding its way into hungry stomachs via Foodsharing.de, and Leih-ein-Buch.de provides avid readers with a digital alternative to conventional libraries. The Potsdam-based Komoot start-up offers a platform for sharing hiking routes and personal experience. Kleiderkreisel, Mädchenflohmarkt, and the online Shpock marketplace developed by Austrian start-up Finderly all help gently used clothes and other items find new homes. The German Slock.it start-up has also made headlines with its plans to revolutionize the entire infrastructure of the sharing economy. Its innovative ideas will allow users to rent, sell and share via blockchain technology. The founders promise greater convenience through complete automation and particularly secure transactions. Dr Nikolas Beutin, a professor of business administration at Quadriga University in Berlin, sees the sharing economy as a decisive shift that will change society as a whole. In the preface to the PWC Share Economy report, he states that just as smartphones disrupted photography and displaced private film and photo cameras, the sharing economy has the disruptive potential to displace people’s ownership with temporary use of products and services. With all the enthusiasm around sharing and trading, it is important to note that Germans are more inclined to borrow from others than to lend out their own property. Only around nine percent expressed a willingness to share with strangers, while eleven percent would not even lend their possessions to an acquaintance. Johannes Zeller is a freelance journalist and media consultant. Copyright: Text: Goethe-Institut, Johannes Zeller. This work is licensed under a Creative Commons Attribution – Share Alike 3.0 Germany license.